In April last year, the Government committed to supporting anyone looking to develop their digital skills to help them get online and make the most of the benefits. It’s a big challenge and one that requires close work with external partners who are committed to achieving the same goal. That’s why, this week, we hosted a Digital Inclusion Forum event attended by many of our charter signatories and the government departments we work with. It was an opportunity to celebrate all the work we have done in the months since the publication of the Digital Inclusion Charter and Strategy, but also to help identify opportunities for closer collaboration and to make firm commitments for the year ahead. We held a similar event in December as a way of shaping the discussions and to look forward to new collaborations and programmes for the January Forum. At the event, we announced that Jon Rouse has agreed to become the Government’s Digital Inclusion Champion. His role will be to make sure that the value of digital inclusion is understood at a senior level across the civil service and to ensure staff are empowered to take it forward within their departments. Speaking at the forum, he explained that digital inclusion was a hugely important area of work inside and outside government and he was keen to work with charter signatories and to hear from them how we could further the agenda in their organisations. We heard from several partners, including speakers from BT, Lloyds and Bromley By Bow Centre, about the importance of investing in digital inclusion and the value it can bring to both businesses and the community, such as reducing social isolation and empowering individuals. The Minister for the Cabinet Office, Francis Maude took the stage alongside representatives from Accenture, Argos and the Tinder Foundation as members of our Q&A panel, answering a range of questions from our delegates. 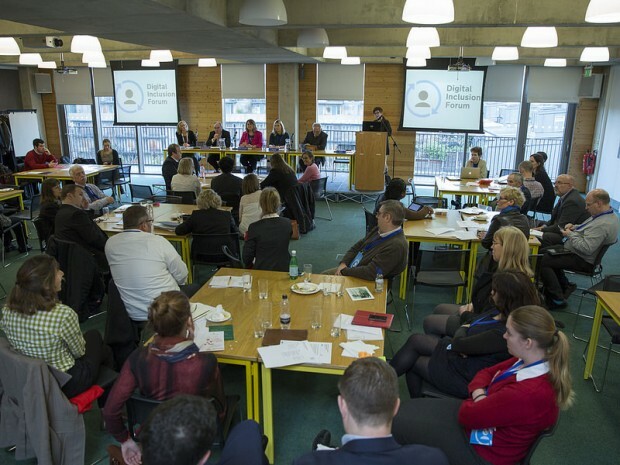 To firm up plans with partners, we also held a series of workshops covering areas that will help increase digital inclusion: for example in libraries, social housing, community hubs, small businesses and charities. 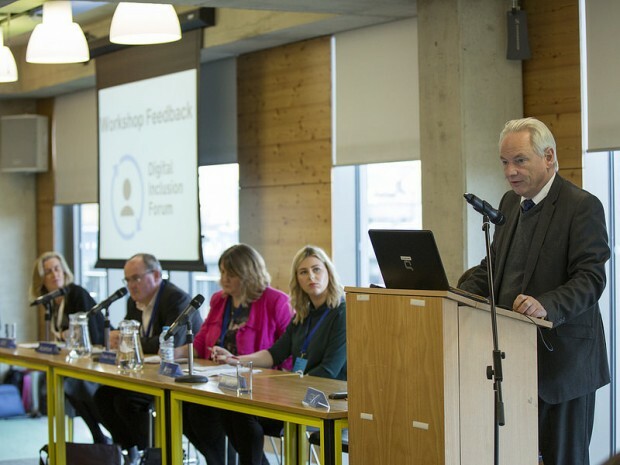 At the event, the Minister for the Cabinet Office, Francis Maude, thanked attendees for their support over the last nine months and spoke about the importance of digital inclusion. He also encouraged participation in the 'Digital Friends' initiative, aimed at expanding informal peer-to-peer networks, and supporting the efforts of charter signatories and government departments to increase digital inclusion within and beyond their organisations. We’ve made a promising start, but we can’t slow down. I am determined 2015 should be the year that we make phenomenal progress in our shared mission to help as many people as possible to make the most of being online. 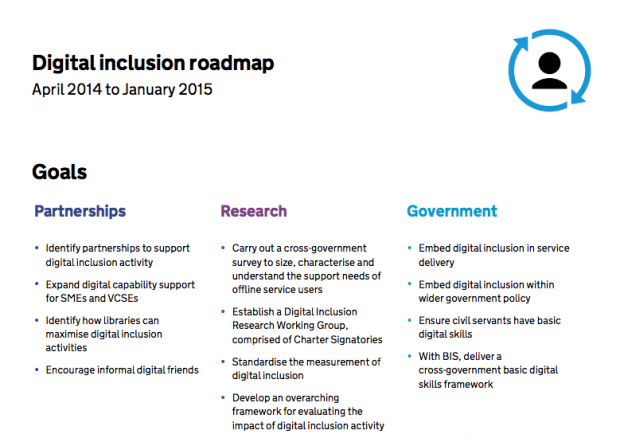 We have been working on improving communications with our stakeholders over the past few weeks and so we have developed a Digital Inclusion Roadmap which we unveiled to partners at the event. The Roadmap highlights key priorities for work with partners, the research group and government stakeholders, setting out what has been delivered, what is in progress and planned activity. This is very much an alpha and we would welcome your comments!